There is an old saying: when it rains, it pours. 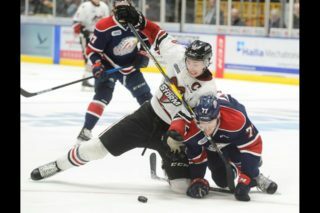 Friday night’s game at the Sleeman Centre proved the saying to be true for the Guelph Storm (1-13-1-0). Tyler Boston opened the scoring with 6:21 remaining in the first period but the London Knights (12-2-1-1) scored the next seven goals, including five in a span of 9:28, as they went on to rout the Storm 9-2. Using their #1 ranked power play, the Knights went 5-for-7 with the man-advantage to bury their division rivals. Christian Dvorak scored five goals with an assist, Matthew Tkachuk scored twice with four helpers, and Mitch Marner helped out with five assists to lead the offence for London. Boston and Vladislav Barulin scored for Guelph. It was the Storm’s 10th straight loss. Boston netted the game’s first goal when he tipped the puck past London goaltender Tyler Parsons after a C.J. Garcia shot from the point. The point was Boston’s fourth in four career games versus the Knights, earning him a point in every career game he’s played against the green and gold. London’s Tkachuk scored his first of two goals a mere 1:11 after Boston’s tally, and the Knights never looked back. Although it took until London’s 22nd shot on Storm goaltender Justin Nichols, the Knights’ leading scorer found the back of the net on the visitors’ third power play of the game. Tkachuk got his second of the night when, on yet another London power play, he one-timed a nice feed from Marner from the right circle past a sprawling Nichols. The Knights led 2-1 after 20 minutes while outshooting Guelph 28-9. From that point forward, it got worse for the Storm and its fans. Just 10 seconds into the middle frame, the OHL’s top-scoring team – with 86 goals – added to their lead. Dvorak notched his first of five goals on the evening when he lifted a wrister over the blocker of Nichols. The Arizona Coyotes draft pick tallied again 1:49 later with the Storm goaltender scrambling to make it 4-1 for the Knights. After the goal, an unhappy Nichols voiced his frustrations that resulted in a 10-minute misconduct for the 1995-born goalie. Nichols would earn himself a five-minute spearing penalty and a game misconduct on the next stoppage in play after a scrum in front of his net, resulting in Bradley Van Schubert taking over the crease. The goaltender swap didn’t effect Dvorak, who scored his third and fourth goals shortly after and just 3:28 apart, both power play markers. Cliff Pu added salt to the wound with a shot from the slot that trickled through the pads of Van Schubert. A goal from Barulin with 3:21 remaining in the second was the only highlight for the home team in a forgetful period. Barulin cut to the net when rookie Nate Schnarr, playing in his first OHL game, fed the Russia native with a nifty pass before he tapped it by Parsons. Dvorak and Chandler Yakimowicz scored two late goals 10 seconds apart for the Knights as they thumped Guelph, 9-2. The Storm continue to struggle to find the back of the net, having scored just 25 goals on the season. No other team has less than 39. Nichols turned aside 27 shots before being ejected and Van Schubert made 12 saves in relief. Parsons stopped 22 shots in the Knights’ victory. Final shots were 51-26 for London. 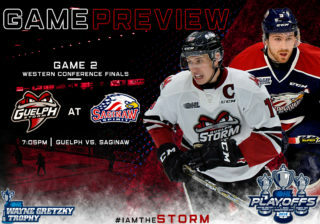 The Storm will look to snap their skid tomorrow night when they visit Flint for a battle with the Firebirds. Puck drop is slated for 7:30 PM. – Tonight’s game was the 1st of 6 meetings this season between the two teams. London leads the season series 1-0. Last season, London won the season series 4-2. – With his first period goal, Guelph’s Tyler Boston continued to record a point in every career game he’s played versus London, with 4 points (2+2=4) in 4 games. – With an assist on Tyler Boston’s goal, Storm defenceman C.J. Garcia now has points in 3 straight games (1+2=3). – Both teams have combined to score 7 or more goals in all but one of their last 13 meetings. 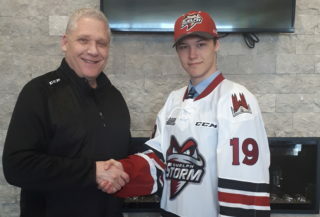 – Storm forward Nate Schnarr made his OHL debut and recorded his first OHL point with an assist on Vladislav Barulin’s 2nd period goal. – Guelph has lost 10 games in a row. 1st Period-1, Guelph, Boston 4 (Garcia, Barulin), 13:31 (PP). 2, London, Tkachuk 6 (Dvorak , Piccinich), 14:42 (PP). 3, London, Tkachuk 7 (Marner , Piccinich), 16:32 (PP). Penalties-McEwan Gue (high sticking), 0:14; Philips Gue (interference), 9:41; Mattinen Ldn (interference), 13:23; Smith Gue (interference), 14:07; McFadden Gue (tripping), 16:04. 2nd Period-4, London, Dvorak 8 (Tkachuk , Marner ), 0:10. 5, London, Dvorak 9 (Mete, Tkachuk ), 1:59 (PP). 6, London, Dvorak 10 (Marner , Tkachuk ), 3:42 (PP). 7, London, Dvorak 11 (Marner , Tkachuk ), 7:10 (PP). 8, London, Pu 2 (Sherwood, MacDonald), 9:38. 9, Guelph, Barulin 2 (Schnarr), 16:39. Penalties-Philips Gue (high sticking), 0:55; Philips Gue (high sticking), 1:55; Nichols Gue (game misc-spearing), 1:59; Nichols Gue (spearing), 2:55; Jones Ldn (closing hand on puck), 5:41; Smith Gue (check to the head), 6:58; Dvorak Ldn (hooking), 11:28; Marner Ldn (slashing), 16:52. 3rd Period-10, London, Dvorak 12 (Piccinich, Marner ), 13:55. 11, London, Yakimowicz 2 14:05. Penalties-Hall Gue (roughing), 0:00; Jones Ldn (slashing), 19:32; Philips Gue (roughing), 19:32. Shots on Goal-London 28-11-11-50. Guelph 9-11-6-26. 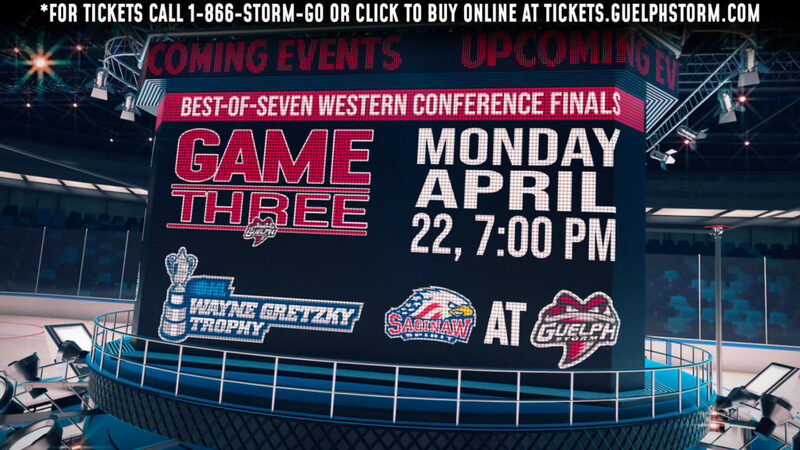 Power Play Opportunities-London 5 / 7; Guelph 1 / 5. Goalies-London, Parsons 10-1-1-1 (26 shots-24 saves). Guelph, Nichols 1-8-1-0 (31 shots-27 saves); Van Schubert 0-4-0-0 (19 shots-14 saves). Referees-Ryan Carroll (9), Jason Goldenberg (19). Linesmen-Jean-Francois Menard (52), Dave Pfohl (96).